The "Chalcogenide materials and Glasses" team is one of the 11 teams of the Institut Charles Gerhardt. The 6 team researchers, chemists and physicists, are involved in the synthesis and characterization of chalcogenide materials, crystallized or vitreous (most often), solid or as thin films, whose applications cover many areas including ionic solid, infrared integrated optics and data storage. If the team heavily relies on a long and internationally recognized expertise (glass, ionic conduction, thin film), it adapts and innovates constantly to respond to new challenges (development of porous chalcogenide materials, heat-generating glasses). It strives at all times to expand its skills. Thus, in the field of development, after having invested in a thermal co-evaporation set-up which allows the preparation of thick layers of perfectly controlled compositions, particularly useful for developing its project in infrared integrated optics, it recently invested in a mechanical alloying device that allows to prepare glasses and glass-ceramics, attractive to work in ionic solid and thermoelectricity. Relying on the skills of the Institute she also addressed the synthesis of chalcogenides by a liquid route. As part of material characterizations, efforts have recently focused on the development of skills in the field of large instruments on the one hand and near field microscopy on the other one. Now, efforts are focused on the structural characterization by NMR of Solid, which constitutes a growing field. Nuclei yesterday inaccessible to studies (quadrupolar, …) can now be used, some of which are of obvious interest to work in the field of chalcogenides: 125Te, 69Ga, 73Ge, 33S. Moreover, sophisticated pulse sequences to study the correlations between nuclei in the material can be used on more and more powerful spectrometers. The recent arrival in the team of a specialist researcher in Solid NMR allows to consider extensive characterizations by this technique (eg those based on the adaptation of latest methodologies developed for wide spectra). 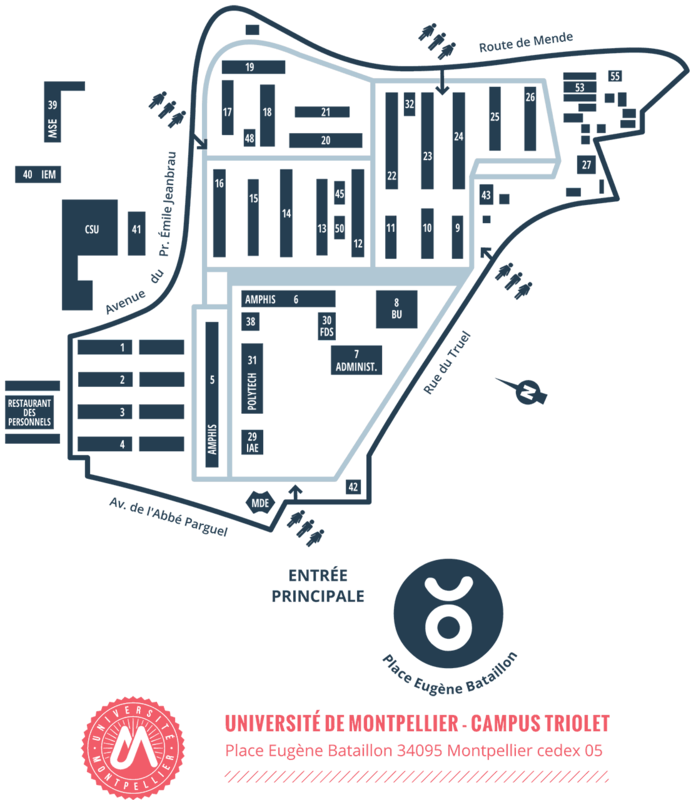 The team "Chalcogenide materials and Glassess" is located in the University of Montpellier, Faculty of Science (Building 15, 2nd floor).